In 1914, the Courtenay Herald enthusiastically described conditions in the Comox Valley for dairy farming, “It is doubtful if there are more suitable conditions for the breeding and feeding of livestock than are to be found in the Courtenay- Comox district and its fertile valley comprising some thousands of acres. For dairy farming the district is unquestionably the finest on Vancouver Island.” Settlers had been producing dairy products since the late 1800s and the potential for a dairy industry was there. But many small farms could not afford the equipment they needed to process larger quantities of milk and butter. The Comox Co-operative Creamery Association was established in 1901 to meet this challenge and succeeded in supporting a dairy industry still alive today through the efforts of local farmers and Saputo Dairy Products of Canada. 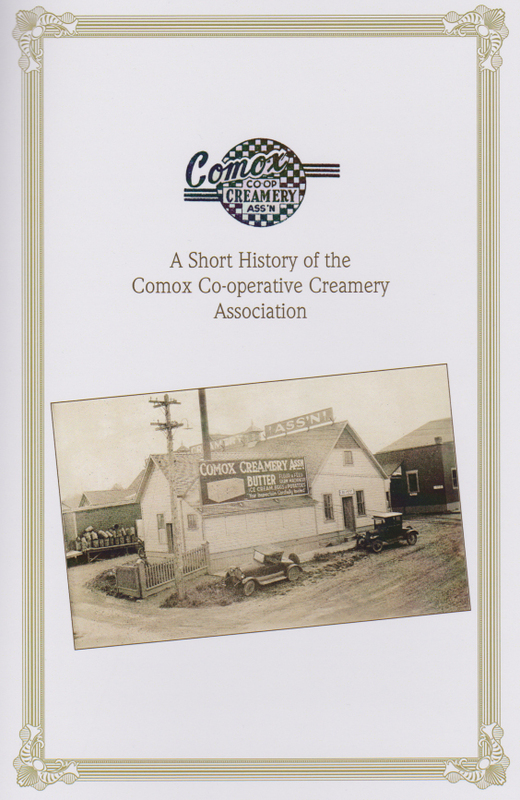 To honor this legacy, the City of Courtenay Heritage Commission and the Courtenay and District Museum have just published A Short History of the Comox Co-operative Creamery Association. This 16-page booklet includes a summary of the history of the Creamery with archival and private collection images and excerpts from correspondence and publications. The booklet is available in the museum gift shop. “Before Television” has been a newsletter feature that shares the Courtenay and District Museum collection with readers while at the same time highlighting the ingenuity and creativity of people as they added beauty and personal style to items from their home and work life. This month’s installment may not highlight ingenuity and creativity but the cover definitely features some over-acting! 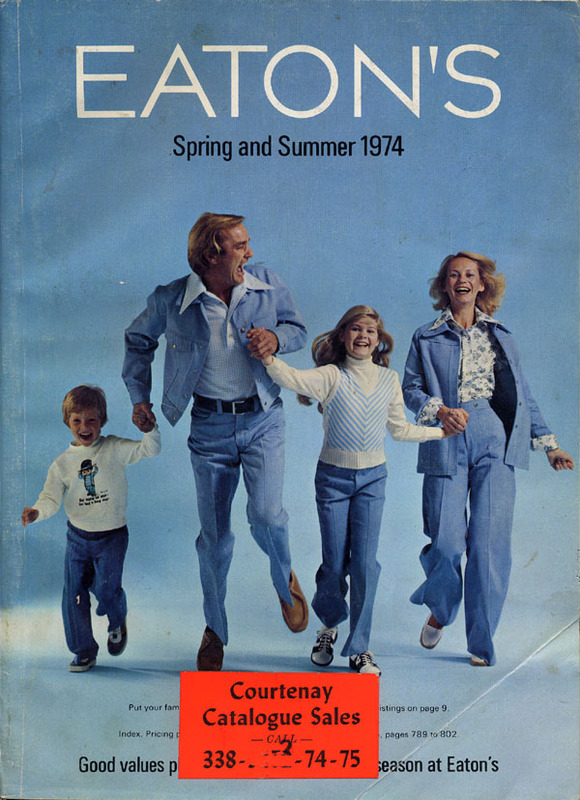 In 1974 Eaton’s Courtenay branch was located at 307 5th Street – still known as the Eaton’s Building to longtime residents. The business closed in 1981 and the building was converted to the City Centre Mall in 1982. It is currently home to various businesses including Uptown Yarns and Linda’s Leather & Shoe Service. The building was recognized for its heritage significance by the Courtenay City Council in 2008. The Native Sons Hall has been the site of countless gatherings and celebrations over its 86 year history. Here’s one you may not have seen coming…a testimonial dinner to honour then Premier W.A.C. 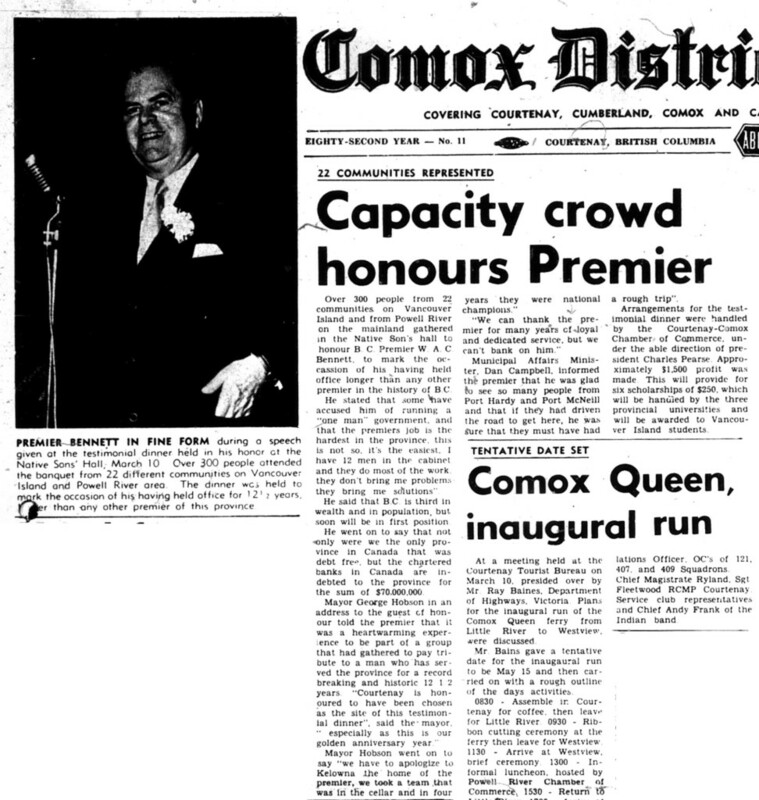 Bennett recorded in the March 17, 1965 edition of the Comox District Free Press. If you’re looking for a fabulous gift, now is the time to visit the museum gift shop. Right now we have a large variety of bags and totes on sale for 30% off the regular price. Lots of designs to choose from – come in early for best selection. The museum has a great friend in Coral Dunn who is volunteering her time and talents to sew colorful elasmosaurs which have proven extremely popular. 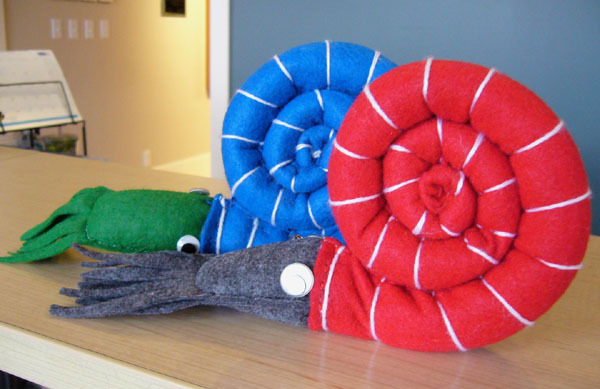 She’s also created ammonites. These cute little guys are already a hit. Many thanks for all your work Coral! New items for kids have recently arrived in the shop: science time kits that make it easy to create a volcanic eruption or an air jet rocket, dig out kits with rock, mineral and gem kits, dinosaur skeletons, fossils, dinosaur heads and dinosaur poop kits. These kits are a great way for children to have a fun learning experience. The Courtenay and District Museum is looking for photographs of the “old Agricultural Hall” located at the present site of the Lewis Centre. This Agricultural Hall was built in 1936 and was described as having log siding with a shaked roof. The hall later became known as the CRA (Courtenay Recreation Association). The museum is looking for photographs of the exterior of the building in any of its various forms as additions and alterations occurred over the years. If you have images to share please contact Catherine at the museum 250-334-0686 ext 104 or email museum@island.net. Last year’s Easter celebration was so much fun that we’ve decided to do it again! This year’s big event will be on Saturday April 12, from 11am – 2:30pm. It’s sure to be a fun time for the whole family. Admission is by donation. 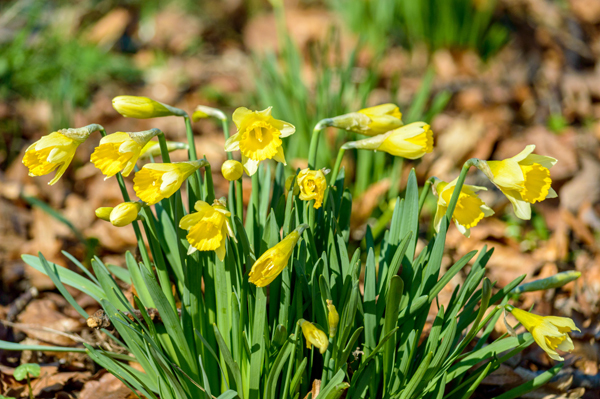 Activities planned for the day include: an opportunity to make an Easter-themed craft, a special display of over 100 amazing brightly coloured egg- shaped minerals and a visit at some point from the “Hot Chocolates” bunny who will be hopping by to give out some delicious samples. Of course the feature activity will be a petting zoo in the Rotary Room Gallery where everyone can make a fuss of lambs, kids (the goat kind), bunnies, ducks and hens. We would like to give a big thank you to the 4-H Club for bringing and caring for the animals.